The new Reloop RP-8000 Professional Hybrid MIDI DJ turntables sport some of the familiar Super-OEM turntable DNA including the same high-torque motor and tonearm that is found on the Stanton ST-150, Reloop RP-6000, AT-LP1240, while still maintaining a “Technics 1200” layout and feel. Even though the Reloop RP-8000 shows some of the same characteristics as it’s Super-OEM brethren, it also has a few additional features that you can’t find anywhere else including: a digital Pitch LED display, eight rubberized MIDI pads, four MIDI layer buttons, and an over-sized encoder knob which can all be mapped to any MIDI compatible DJ software out on the market today. The Reloop RP-8000 turntables have a familiar "Technics" turntable look and layout with a black aluminum top plate, recessed aluminum pitch sliders, motor-off control, and the familiar aluminum start-stop buttons found at the corners. The folks at Reloop wanted to make sure that the base Technics users would have a very easy time making a transition from their beloved 12’s over to the RP-8000’s. Reloop has succeeded with this mission as the RP-8000 feels like a 1200. The Pitch slider is smooth and has the same metal style knob while the start/stop button feels almost exactly like the 1200 button in every way. 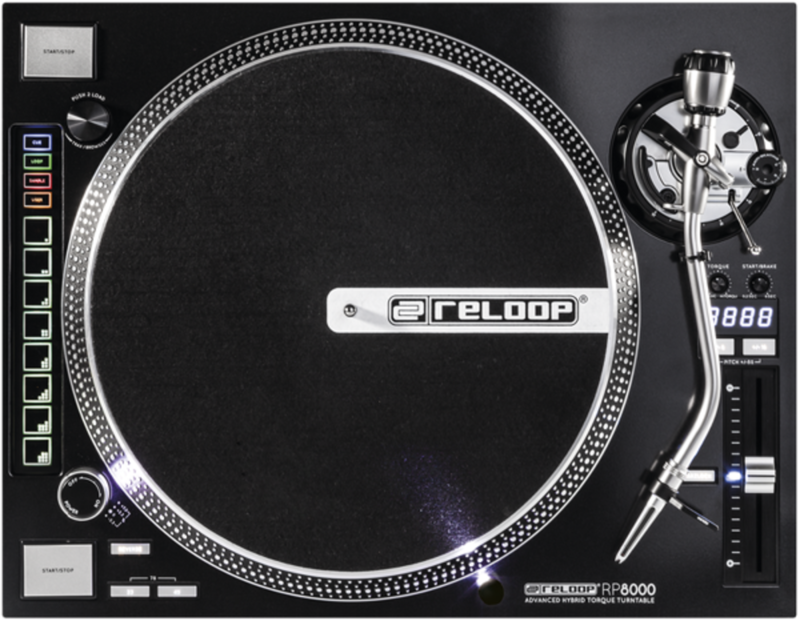 The Reloop RP-8000 has a mixture of metal and plastic in its construction with the top plate being made of aluminum and the sides being made of a hard plastic. The platter and tonearm are also metal and are exactly the same as the other Super-OEM turntable offerings. The overall weight is about 22lbs which makes it a bit lighter than a 1200 and quite a bit lighter when compared to the Stanton ST-150/STR8-150 series that these will undoubtedly be compared to. The construction of the RP-8000 feels like it will last the test of time and hold up well through Mobile DJ use, but I would have liked to see the bottom half of the turntable have that familiar rubberized coating that just makes turntables feel more rugged and sturdy overall. The RP-8000 Turntables have an RCA output on the rear which is recessed and can be switched between Phono or Line level depending on your needs. There is a USB connector for the computer connection and another USB connector so that users can daisy chain up to four RP-8000’s together so that only a single USB cable needs to be connected to a computer. There’s also an “infinity” style power connection for AC IN. All of the cables that are included with the RP-8000 (Power, RCA, & USB) have a right angle to them so that the turntables can be flipped to “Battle” position and still sit nice and flush against the mixer. Around the back, there are also spaces for hinges. I’m not sure if these actually work or if there is a cover that actually fits them, but it’s worth pointing out that the RP-8000’s don’t come with any type of dust cover. The RP-8000 turntables have the same direct drive, super-high-torque motor as the other Super-OEM variants with 4.5kg of startup torque, a black removable target light, and dual aluminum start/stop buttons for battle DJ&apos;s. The Start/Stop buttons feel just like the buttons on the Technics 1200 and they work the same as well. The motor off knob feels like the familiar Technics style once again, but the behavior of this control is a weak point. When the turntable is running in Phono output mode and the motor off knob is engaged, the platter will monetarily speed up before it starts to slow down. Worse yet, when the turntable is running in Line output mode and the motor off knob is engaged, the sound completely cuts out and the turntable is truly off. I was rather surprised by this motor-off behavior as this is a feature that I personally use quite a bit in my transitions. Next up, there are small rubberized buttons that handle the reverse, RPM speed select (33, 45, 78), pitch range select (8, 16, or 50%), and Quartz Lock button to get the pitch back at perfect speeds. The pitch slider again feels just like the one found on a Technics 1200 turntable. It doesn’t have a center click, but there is a small LED that lets the user know when they are back at zero. The slider is silky-smooth and has a very high resolution so that DJ’s can get that perfect BPM for mixing. Above the pitch range buttons is a digital LED readout that shows the user the pitch percentage at a glance. This is a useful feature for those who like to manually beatmatch and perform “doubles” tricks. Above this Pitch display is the Torque and Start/Brake adjustment knobs. The motor torque can be changed using the torque knob to feel more like a traditional Technics turntable or fast like a Super-OEM. The start/brake adjustment knob allows the start/stop time of the platter to be adjusted between .2 seconds to 6 seconds depending on your needs. The RP-8000 is still mostly based on the “Super-OEM” turntable architecture which is a great attribute. Hanpin Super-OEM turntables are still arguably the best turntables for DJ’s in the world with the best and strongest motor out on the market today. DJ’s all over the world swear by them and they are now proven in the longevity category with a 9-year history already in the books. The RP-8000 has the same S-shaped tonearm assembly as the others and I was able to easily set it up and get started. The RP-8000 comes with a nice felt Reloop branded slip mat that was more than adequate enough for my needs. The RP-8000 does not come with a headshell or a cartridge so you’ll have to source one on your own when it’s time to purchase. We tested the Reloop RP-8000 turntable with an Ortofon Q-Bert Concorde cartridge and the results were excellent. The tracking was just right after we setup the tonearm height/weight and there was not a skip to be heard or seen during our scratch and juggling sessions. The big standout feature of the RP-8000 turntable is the inclusion of MIDI buttons and an oversized encoder knob that can be used to control DJ Software. 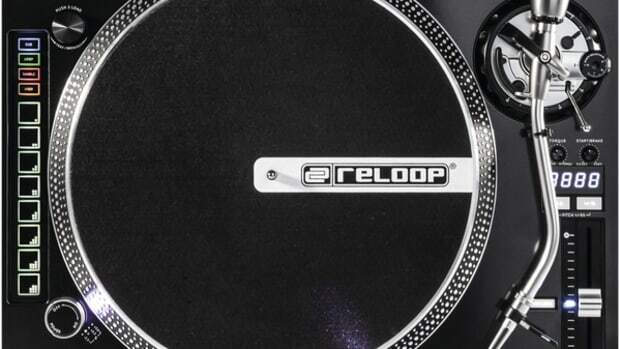 The Reloop RP-8000 is known as a Hybrid turntable due to this cool new feature. 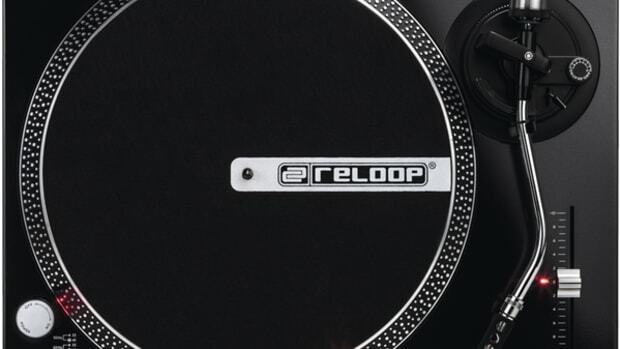 The Reloop RP-8000 has a Serato DJ mapping file located on their website so that DJ’s can immediately take advantage of the Cue, Loop, and Sample controls right out of the box. There aren’t any other mappings for other DJ software currently available via Reloop, but the RP-8000 MIDI controls can be mapped and programmed to handle any features and functions one deems necessary. The RP-8000 has a huge metal knob encoder that can also be pressed to make selections. This knob is best mapped to navigate through tracks and folders which make it easy to load new tracks into the deck that is in use. Next, there are four smaller layer pads that specify the use of the eight bigger pads that are actually used for control. All of these buttons are rubber and they respond really well to drumming and quick button mashing. All of the buttons illuminate one single color to let you know what layer or button is active. In Serato, the Cue button turns the eight pads into hot cues, while the loop layer turns the pads into manual and auto loop controls, while the Sample button activates the SP-6 sample banks, and the User button activates a specified user mapping to control anything the user wants. The user can select two combinations of the layers which will turn the top four pads into the top layer selection and the bottom four pads into the bottom selection. For example, if Loop and Sample are selected simultaneously, then the top four pads will work for Loops and the bottom four pads will work as samples. Overall, the function of the MIDI buttons is a huge plus. The MIDI pads were a bit close together, but they still worked well for my needs and I didn’t have many accidental touches during drumming routines. If the pads are hit too hard, the needle will definitely skip. Many users will rely on external controllers or a dicer style solution, but having these buttons integrated into this neat package is a game-changer. The MIDI functions, along with the ability to daisy-chain up to four of these units together with only a single USB cable connecting to a computer makes this a seriously viable option for DVS users. In conclusion, we are going to highly recommend the Reloop RP-8000 Professional Hybrid Turntables to any DJ who wants the best of both the analog vinyl and digital worlds in one powerful package. The Reloop RP-8000 has good overall construction, a super-strong 4.5kg motor, and lots of extra features to control different aspects of the mix. The RP-8000 also has very high resolution pitch controls with a digital LED Display to show the user the pitch percentage at a glance. The RP-8000 also has the “game-changing” MIDI controls which feature eight backlit rubberized MIDI pads with four different layers and a selector encoder knob for easy file navigation and selection. 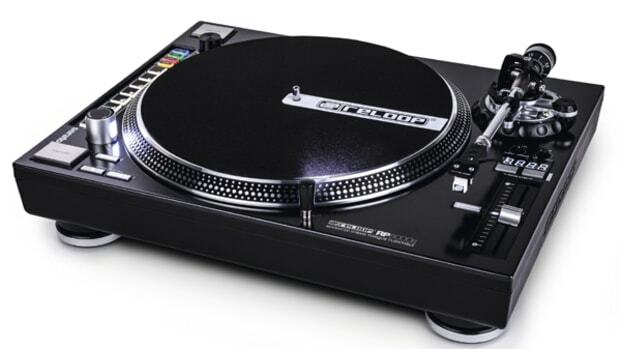 Even though the motor off button has irregular behavior and there is no dust cover or headshell included, the RP-8000 Hybrid Turntables are an excellent solution for Digital Vinyl DJ’s looking for vinyl turntables with the ability to communicate with their DJ software with the intuitive MIDI pads and controls found onboard. The recently released Reloop RP-8000 Professional MIDI DJ turntables sport some of the familiar Super-OEM turntable DNA including the same high-torque motor and tonearm that is found on the Stanton ST-150, Reloop RP-6000, AT-LP1240, etc. The RP-8000 also has an additional digital Pitch LED display, eight rubberized MIDI pads, four MIDI layer buttons, and an over-sized encoder knob which can all be mapped to any MIDI compatible DJ software out on the market today. The main difference with these new Reloop turntables is that they have a familiar "Technics" turntable look and layout with a brushed aluminum top plate, recessed aluminum pitch sliders, and the familiar aluminum start-stop buttons found on the corners. 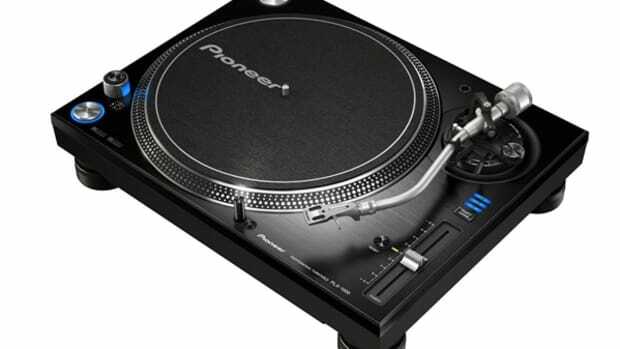 The Pitch range of these turntables can be switched from +/- 8%, +/- 16% and +/- 50% and there are also start and stop adjustment knobs to control the speed that the platter starts and stops the track. Reloop has just announced two brand new turntables at the BPM 2013 show this weekend that is sure to get vinyl and DVS users very excited. Introducing the Reloop RP-8000 MIDI hybrid turntable (above) and the RP-7000 high-torque turntables without the MIDI control. These new turntables have the familiar Super-OEM internal makeup with high torque direct drive motors while the RP-8000 adds a host of MIDI on-board control buttons and an encoder knob for DJ software mapping and control. The new Reloop RP-8000 Professional Hybrid MIDI DJ turntables sport some of the familiar Super-OEM turntable DNA including the same high-torque motor and tonearm with the additional features such as the digital Pitch LED display, eight rubberized MIDI pads, four MIDI layer buttons, and an over-sized encoder knob which can all be mapped to any MIDI compatible DJ software out on the market today. Reloop has just released a new three-part Tutorial Video Series to show the main features of the RP-8000. Reloop has just dropped a BOMB for vinyl DJ's by announcing its new Reloop RP-8000 Straight turntable with a straight tonearm that is great for scratching. Reloop has also announced a new RMX-60 Digital mixer for NAMM 2015. These two products were announced by a quick surprise video from Reloop with turntablist DJ Fong Fong going to work on the new RP-8000 Straight turntables and the RMX-60 Digital four-channel mixer. Check out the video and our thoughts after the jump. The brand new Reloop RP-8000 MIDI hybrid DJ turntables have been turning up everywhere across the globe since they've been released and many famous DJ's have been popping up with new videos to show off some new tricks and techniques. The latest DJ to put out a great performance video with the Reloop RP-8000's is DJ ND. Check out our full video review of the RP-8000's then see a true DMC DJ show you what they can do. As we reported in an earlier NAMM 2015 story, the Reloop team has decided to release their flagship RP-8000 turntables in a straight tonearm edition to appease many scratch DJ's who are more comfortable with the straight arm skip resistance. The new RP-8000 Straight turntables will have all the same features and functions of the original RP-8000 Hybrid Turntables we reviewed last year with a new tonearm option for those who want it. As turntables and vinyl seem to be hitting a new strides with newfound success in the DJ and consumer markets; the manufacturers who create these turntables are giving users options for all budgets and performance levels. Reloop has introduced a new video to accompany their new Direct Drive Entry level turntables with USB connectivity (for transferring a vinyl music library to the computer) called the RP-2000USB. These aren't the powerhouse Super-OEM RP-6000/7000/8000, but they cost less than half of those models and they can still get the DJ-job done at a lower cost.